Melissa has read 16 of 90 books. Melissa read 83 books of her goal of 70! Melissa read 71 books of her goal of 50! 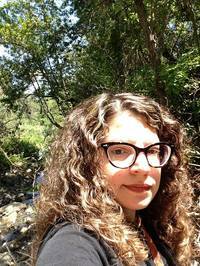 Melissa Eleftherion is a writer, librarian, and a visual artist. She grew up in Brooklyn, dropped out of high school, and went on to earn an MFA in Poetry from Mills College and an MLIS from San Jose State University. She is the author of field guide to autobiography (The Operating System, 2018), & six chapbooks: huminsect (dancing girl press, 2013), prism maps (Dusie, 2014), Pigtail Duty (dancing girl press, 2015), the leaves the leaves (poems-for-all, 2017), green glass asterisms (poems-for-all, 2017) & little ditch (above/ground press, 2018). Founder of the Poetry Center Chapbook Exchange for San Francisco State University, Melissa now lives in Mendocino County where she works as a Teen Librarian, teaches creative writing, & Melissa Eleftherion is a writer, librarian, and a visual artist. She grew up in Brooklyn, dropped out of high school, and went on to earn an MFA in Poetry from Mills College and an MLIS from San Jose State University. We’d love your help. Let us know what’s wrong with this preview of Woman at 1,000 Degrees by Hallgrímur Helgason. We’d love your help. Let us know what’s wrong with this preview of Deaf Republic by Ilya Kaminsky. We’d love your help. Let us know what’s wrong with this preview of Self-Care for Cats (And Their Humans) by Patricia Washburn. Hey everyone! I've always wanted to run a book club and I want to #makeithappen with the best of librarians I know how! Let's do a monthly book club! Aren't you glad I sent you this sugar-teet/myspace for geeks? I see you've been busy! 120 books? in like 2 hours or something. Damn, dude.